For weeks now I've been talking about my "Spring Brides". Looks like we're almost into summer. Where did the time go? One of the things that make my life feel like summer is the Farmers Market. 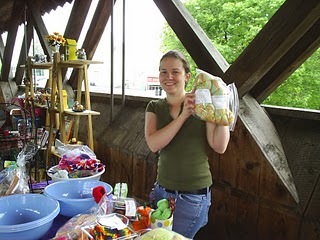 The market in St. Marys started on May 31st. It was a beautiful day and my friend Kat and I enjoyed a relaxing morning on the bridge. baby shoes, jewelry and all sorts of stuff. I encourage everyone to attend our Farmers Market. 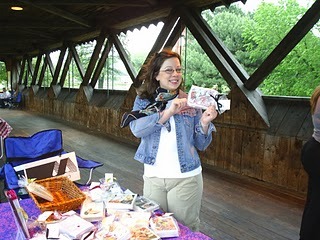 It's held every Saturday from 8-12 at the Covered Bridge in St. Marys. You'll find unique items, yummy food (not to mention free samples) and entertainment.